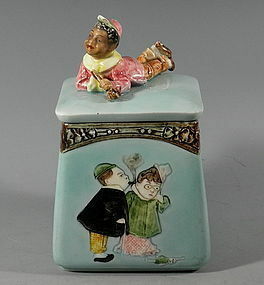 Rare and unusual majolica porcelain tobacco jar or humidor featuring a black child holding a pipe as the lid's finial. On the front of the jar are what appears to a boy in costume blowing smoke into a girl's, also in costume, face. She has turned her head away and has dropped a doll. The 2 sides adjoining the front each have a flower and the back of the jar is plain. Except for 2 small chips on the underside of the black boy's cap, the jar is in excellent condition. The black boy'x face has a matte finish. Measures 3.5" high, 3.5" across. Circa 1890.